These loggers thought they were high tech back in the 40s. 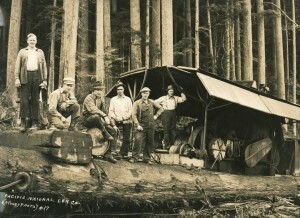 This photo shows the shift from steam to diesel power in in the woods. Pat Van Eaton says this eliminated the need for water and the fire hazard of burning wood to fire the steam boiler. The man second to the right is Ed Raysbrook. I am shocked! I was looking up National and found these pictures. My great uncle Cliff Carmichael is third from the right. When I was a little girl I would go to visit my uncle and aunt Marie in National. I remember my uncle Cliff carrying me on his shoulders, walking on the wooden side walks, to the post office inside a little store to get the mail. I must have been about four years old. I was taken back and started to remember so much from times I spent there. Thanks for the pictures.